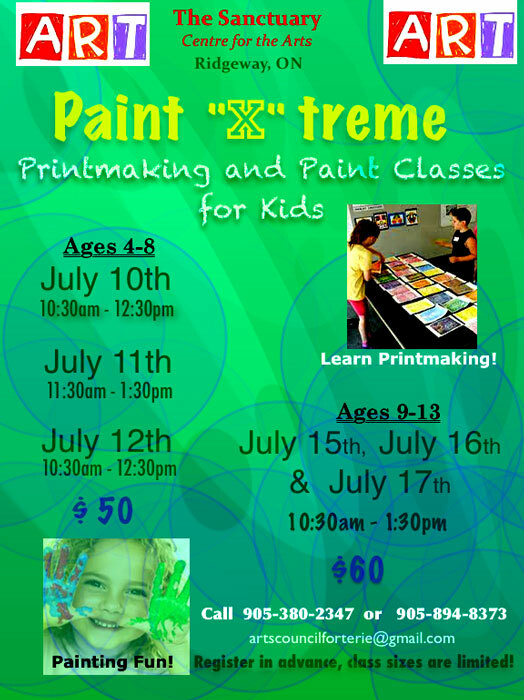 Youngsters and preteens can learn painting and printmaking during three-day art classes offered by the Fort Erie Arts Council in mid-July. Sessions for children aged four to eight run for two hours on July 10, 11 and 12. Sessions for nine to 13-year-olds run July 15, 16 and 17. Classes will be held at the Sanctuary Centre for the Arts, 209 Ridge Road, Ridgeway. The cost is $50 for the younger group and $60 for the older. Register early because the class sizes are limited. For information call 905-380-2347 or click the poster to see the email address.